On the occasion of India's 70th Independence Day, Catch asks the question: how free are the people of the country's hinterland, and what freedoms and facilities would they like to enjoy? To answer this question, we have chosen locations within approximately 70 kilometres from the national capital. Here's the real picture from the ground. Human civilisation originated along rivers. Today, just 70 km from New Delhi, an entire region is terrified of rivers. Hindon, a tributary of the Yamuna, is so polluted that villages on its banks in Bagpat district, Uttar Pradesh, have taken to calling its water 'zeher'. Poison. The zeher seeps into their groundwater, and through handpumps, makes its way into their bodies and those of their cattle. It is now the subject matter of a case in the National Green Tribunal, which has thrice ordered clean water to be supplied to these villages - the last on 19 July. Catch travelled to Bagpat to discover that the state is clearly in contempt of the NGT's orders. It is still in two minds about whether there is a crisis at hand. Abandoned by the state administration and overshadowed by the national capital, thousands are living in fear of a mere glass of water. Except the well-to-do - of course, they have installed filters. I first ran into residents of Bagpat district at the National Green Tribunal's principal bench in Delhi. A dozen men and women had turned up from villages on the district's northern fringe. I noticed that many had deformed legs, feet or spinal cords. One had a swollen tongue, while another could only crawl. Through an NGO, they had moved the Tribunal in November 2014, seeking relief from the havoc caused by the Hindon, Krishna and Kali rivers. The petition claimed that these rivers were laced with chemical wastes poured by 45 types of industries upstream. The Tribunal had asked for a slew of studies on the pollution. As an immediate relief, it had, on two occasions in 2015, ordered the state government to supply clean drinking water, through either tankers or water bottles. This was 19 July 2016, and no water had yet arrived. NGT chairperson Justice Swatanter Kumar lashed out at the Uttar Pradesh state counsel, calling it a 'disgrace' and 'lack of governance' that still no water was provided. The bench then passed an order making the state chief secretary and three other senior officers responsible for providing clean water wherever it wasn't. It said it will pass 'coercive and punitive orders' otherwise. The villagers were optimistic. A chief secretary cannot take such a risk, they felt. I cautiously agreed. On a cloudy morning on 9 August, I made my way to Bagpat with a small team of journalists to know what had happened since the NGT order. As I had feared, nothing had. The villagers' optimism had faded. "There has been no tanker, no bottled water. We are still drinking zeher." We had landed at the residence of Rajiv Kumar, the gram pradhan of Tavela Garhi and three adjoining villages. Kumar had accompanied the victims to the NGT in July. We were in a room with about 10 men from the village, who had already gathered there and spoke up when we broached the topic of water. None of the three villages Catch visited - Tavela Garhi, Patti Banjaran, and Sarora - have ever seen a water tanker. They continue to draw water from handpumps, which are about 200 feet deep. But at this depth, the water mixes with that of the polluted river. The UP government came up with one scheme - its only serious response so far - to build water tanks. These tanks will draw water from 500 feet, where the water is still drinkable. "But it's been a few years, I have sent several proposals for the tanks. The UP Jal Nigam has not responded," says Kumar. Bagpat district is due north of Delhi. As we left the national capital behind, the state highway abruptly lost its tar and was replaced by exposed stones. Industries and housing schemes along the road were replaced by lush sugarcane fields. At an eastward diversion, a narrow winding Pradhan Mantri Gram Sadak Yojana road had brought us to Tavela Garhi. We passed by handpumps with hand-painted signs in Hindi that said that the water was unsafe to drink. These were not sealed, and people continued to draw water. Dripping outlets of some pumps had left terrifying red stains on the concrete base below. There are a few things one would expect in such a situation. One, that the government either accepts that there is a problem, or rejects it with evidence. The Uttar Pradesh government is confused. In a sworn affidavit filed before the NGT in March 2015, about four months after the petition was first filed, the then-district magistrate of Bagpat, Dhanalakshmi K, said there was neither any pollution in the Hindon and other rivers, nor was there any effect on public health. The state's denial was so passionate and total that it deserves to be reproduced in parts. On the first page: "Each and every averment made in the application under reply is denied in totality save and except those admitted hereinafter." "No such type of diseases were found in the area of District Bagpat." "No such alarming and grave situation of the disease mentioned..."
"Samples of groundwater ... were found to be within the parameter of the sanctioned standard of pollution." "Every possible steps [sic] to educate the people of the area to use clean and safe water." "It is apparent from the aforesaid submissions that the present application is baseless and devoid of merits hence liable to dismiss with cost." The vehement denial fell flat within a month. One study by the UP Jal Nigam, conducted in January 2015, found excessive iron, lead and manganese in some samples. The NGT commissioned another study by the UP Pollution Control Board. The Board took 48 water samples from Bagpat district. All were found to be heavily polluted. The water was excessively hard, with too many dissolved solids. All samples contained metals such as lead, manganese and magnesium beyond acceptable limits. Interestingly, in December 2014, the Central Pollution Control Board had also filed in an affidavit to the NGT saying that the water of Hindon "does not meet primary quality criteria". Of the 300 households in Patti Banjaran village, 25 to 30 have at least one member with deformed legs. Or a bent spine. For some, the problems seem to have occurred not at birth. Washid, who is about 30, has been bedridden for around five years. He had completed high school when he started falling ill. First, there was diarrhoea, then, his hands and legs "started tightening", he says. He adds that a doctor in Meerut told him that this was because of the drinking water. The same goes for Salman, 19, who has a contorted spine. The same goes for Qader, 26, who has to crawl because his legs have given way. The same goes for Nimki, a mother of two, whose legs have bent over the last decade. "I sold my plot of land to spend Rs 1.5 lakh on her treatment. Nothing happened. Now look where I live," her husband Rahil says, pointing to a shanty built with straw, wood and metal scrap. (More about Nimki and Rahil in the accompanying video). The gram pradhan himself fell sick last year with a liver ailment, and based on his doctor's advice, installed an RO water purifier in his home. "But there are just two to four houses which have afforded to install RO. This village is poor," he adds. All those we spoke to said they go to a hospital in Meerut, which is about 35 km from the village. Some others go to the tehsil headquarters at Badaut. Nobody has been to the district hospital at Bagpat town. The primary health centre doesn't look at cases other than the simplest of flu. In the affidavit filed by the then-district magistrate of Bagpat, there is an attached statement of the Chief Medical Officer of the district, which the DM uses to say that there is no health crisis. The statement ignores the physical disabilities, stressing instead on cancer. Listing seven cancer patients, the statement concludes that the causes are unknown. There's yet to be a study linking the nature of pollutants with the health problems the villagers are facing. For all its claims for or against the pollution in the river, the Uttar Pradesh government hasn't been able to prove anything. CV Singh, chairman of the Doaba Paryavaran Samiti, which has filed the case in NGT, says that the nature of health problems matches the kind of pollutants found. Singh is a clinical biochemist from the Haryana State Pollution Control Board. After his retirement in December 2013, Singh visited his native village Daha, which is also near the Hindon. Suspicious about the river water, he collected a few samples and sent them to Simla Laboratory, a certified water testing agency. He says they called him back with the comment that it wasn't river water he'd sent, but some mixture of chemicals. Singh collected samples again, and received the same results. This is what led him to form the Samiti, along with villagers, and file the NGT case. On the 9 August visit, we walked down to the Hindon river, a 400-metre walk from Patti Banjaran through dense fields of sugarcane. "Look, there are no more ants on the ground," pointed out one villager as we neared the banks. Indeed, the river is jet black and smells. "Once upon a time, you could spot a coin on the river bed." 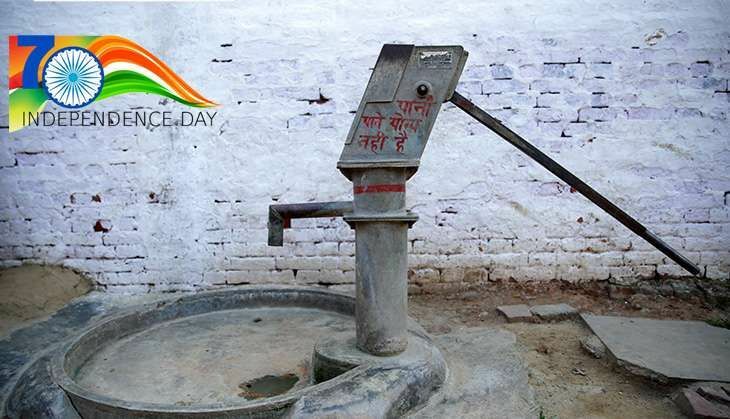 Villagers remember drinking water straight from it, a thought that is revolting today. "We even tie our cattle's mouths if we are passing near the river, so that they don't even sip the water," another villager said. There were once turtles and fish in the river, none of which have survived the chemicals. Hindon, in all its polluted glory, joins the Yamuna river at Ghaziabad, which meets the Ganga at Allahabad. Cleaning up the Ganga is one of independent India's long-cherished dreams. Today, it is in the form of the Namami Gange mission, overseen by a ministry to whose name "Ganga Rejuvenation" was added when the Modi government came to power. What seems to be forgotten is that the Ganga has tributaries. Thousands of crores have been earmarked for the Ganga's cleanup. One of the big plans is to renovate crematoria along the river. Meanwhile, along its tributaries like Hindon, people live on the edge of life. It's hard to miss the irony.